A Canadian rapper has fallen to his death after walking along the wing of a Cessna plane as part of a music video shoot in Vernon, British Columbia. Jon James McMurray, 34, walked to the edge of the wing, causing the aircraft to spiral downwards out of control. McMurray failed to open his parachute because he held on to the plane for too long, his manager said. He died on impact in the accident on Saturday. "He had trained intensively for this stunt", his manager added. The rapper was known for his extreme stunts, which he liked to perform in his music videos, and previously jumped out of a plane in a shoot for a song called "The Man". With more than 17,000 followers on Instagram, the lyricist from Calgary used his social media accounts to post snippets of his "crazy" and "insane" stunts. 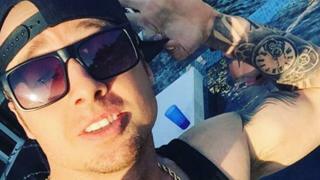 His manager, Ryan Desrochers, said the artist's passion for music videos and extreme sports went hand-in-hand, adding that McMurray tried to combine his interests with his songs in order to push music "in a new direction".